Your navigator does not admit line borders or to show the present configuration. Density scale PCE-DBW is an economical device for determining density with a resolution of 0.001 g/cm³. Density scale is very useful for testing plastics, gums, sintered materials, ceramics, glasses and other non-metallic materials. 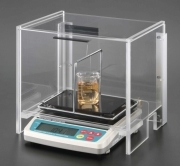 The geometric form of the weighing object is not important for determining density. You will be able to measure density even of floating components, that is, objects with a density under 1 g/cm³. But for this purpose you will need the optional equipment to measure density in liquids. The density of water is 1 g/cm³ at 3.983 °C. Another special characteristic of density scale PCE-DBW is the temperature compensation with a thermometer which is necessary to get exact and reproducible results because density depends on the temperature. Here you will find an overview of our density scales. .
- Automatic density determination in solid substances. - Determination of volume in solid substances. - With the optional device for liquids, density in liquids will also be determined. - Complete package includes: 1 x density scale, 1 x plastic water container, 1 x adjusting weight of 200 g, 1 x base, 1 x attachment, 1 x thermometer, 1 x gripping device, 1 x mains component, user manual. 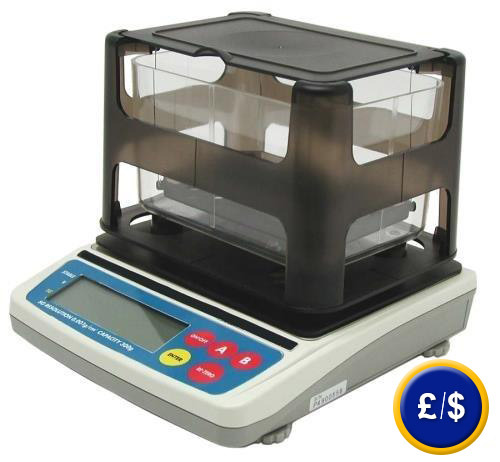 1 x Density scale PCE-DBW, 1 x plastic container for water, 1x adjusting weight of 200 g, 1 x base, 1 x attachment, 1 x thermometer, 1 x gripping device, 1 x mains component and user manual. Official certification comes with an analysis calibration together with a document with measuring values. The name and details of the company or the customer can be included. Here you will find an overview of all the scales and balances available in the offer of PCE Instruments.